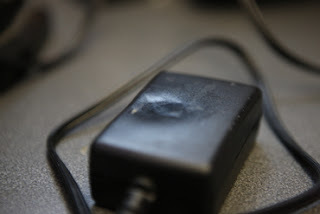 Seems a power supply for a phone was cooking gently. I guess I have to thank our neighbour for reporting poor ADSL to BT and getting a REIN engineer involved as it probably saved us from a fire. This was causing bad enough RF interference to wipe out DSL several houses away. Same engineer that solved a REIN issue when I had ADSL many years ago, and one of the good guys in BT. P.S. REIN is the BT term for the interference that affects your boradband. Stands for Random Electrical Impulse Noise. I've also seen it refered to as Repetitive Electrical Inpulse Noise. Also lucky they tracked it down to that PSU it looks like it's starting to melt itself from what I can see on that Pic. I'd love to get my hands on the REIN-detecting kit that BT use and find out what kills my DSL line here at different times of the day.